COLUMBUS, Ohio (WCMH) — Warm-weather fun is returning to downtown Columbus this month! On Tuesday, Columbus Downtown Development Corporation announced a lineup of summer events at the John F. Wolfe Columbus Commons. 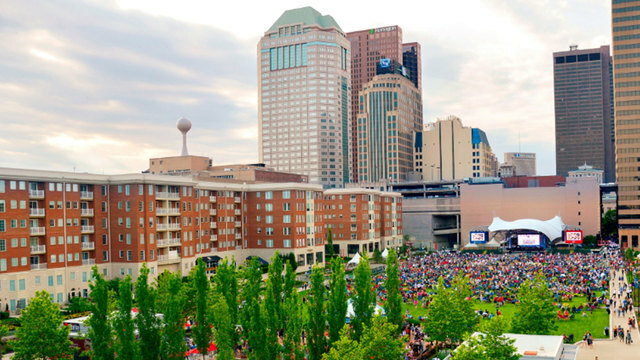 From the Food Truck Food Court and free fitness classes to free movie nights and outdoor concerts, the Columbus Commons is the place to be this summer. The season will officially begin on Monday, April 22, with Jeni’s Splendid Ice Creams and Tortilla opening, and there will even be free carousel rides. Food Truck Food Court returns this year on Thursdays, starting May 2. Eight trucks will be featured along with two rotating trucks each month. Free fitness classes are also coming back, with the first session beginning April 30 and the second session beginning July 30. You can get your sweat on with cardio, yoga, hip hop, kickboxing and Zumba classes on Tuesdays, Wednesdays and Saturdays. Tap or click here to view the full fitness class schedule. The ever-popular Family Fun Day is scheduled for Saturday, May 25. Families can ride the carousel, make arts and crafts, and more. There will be a free showing of a family-friendly movie that evening, and there will also be free family movies on June 21 and July 19. Shadowbox Live will also return with two free performances this season. They will perform their newest show, Leather & Lace: A Tribute to the Women Of Rock, on May 26. On Sept. 1, they will celebrate the 50th anniversary of Woodstock with Back to the Garden, which tells the story of a New York Times sent to cover the festival in 1969. Free Thursday concerts featuring The Suffers, MojoFlow and more, return July 11 and run through Aug. 1. The bar and food trucks open for business at 5:30 pm and the fun continues until 11 pm. If you’re looking to join a summer sports league, check out the Columbus Commons Kickball league. The league plays for two eight-week sessions with two game days a week. The first session begins on May 2. Tap or click here for more information.